Hygiene is an important topic to anyone. With all the conflicting reports on fluoride, I would much rather my family and I stay away from it. It’s super simple to make your own, too. All it takes is a few simple ingredients to keep your mouth “minty fresh” and clean. Mix together and store in a tightly covered jar. We use a spoon to dip some out, and then place it on our brushes for use. We have been using this for over 5 years now, and my children have NEVER had a single cavity! Plus, the added benefit of not having to worry about recycling the packaging is nice. TIPuse a spoon to scoop a bit of this out and then place it on your brush. This will keep it all nice and “sanitary” for those who can’t stomach the thought of everyone’s toothbrush in the same tub. Slightly melt the coconut oil with the beeswax. I use a glass measuring jar in a pot of boiling water. Add the clay and mix. Add the arrowroot powder and mix well. Add the tea tree oil, and mix in. Viola! You have deodorant! To use, we allow it to harden in a small container, then “break it out” so that each person has their own little “stick”. 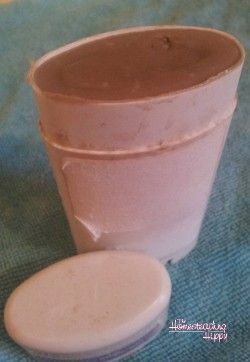 You can also use an old deodorant container and refill it. The shea butter will keep it nice and hard, even in the summer time. In a heat-proof container, add the oils and beeswax. I put my glass measuring cup in a pot of boiling water. Heat on medium high heat until all the oil is melted. Pour the hot liquid in a muffin pan and allow to cool completely. “pop” them out and store in the fridge during the hot summers. To use, simply rub anywhere on your body. Your body heat will help soften and “melt” the lotion on your skin. This may take a bit getting used to, but your hair WILL adjust and not create as much oil. I promise! It works on my baby fine hair and I love it! My hubby used to have a dry scalp, especially in the winter time, but with this shampoo, he no longer has that issue. Pour all ingredients into a bottle, and gently swish to mix. Use 5-6 squirts each time. 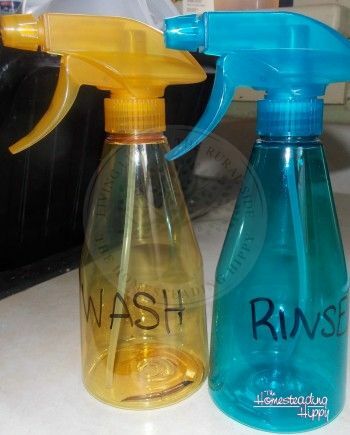 To condition I use another spray bottle with 1 cup water and 1 cup apple cider vinegar. Spritz 2-3 times and rinse well. Oh, to be alcohol free in your hair but still have amazing hold! Would you believe it possible with only 2 ingredients? Yup, it’s true!! You need…are you ready for this??? Melt the sugar completely in the warm water, and place in a spray bottle. You can add essential oils like lavender to this if you want, but I just use it plain like it is. This isn’t a strong hold hair spray, more like “flexible hold”. Hair products sans toxins are SO HARD to find! I’m definitely trying your hairspray recipe! Oh I love this! 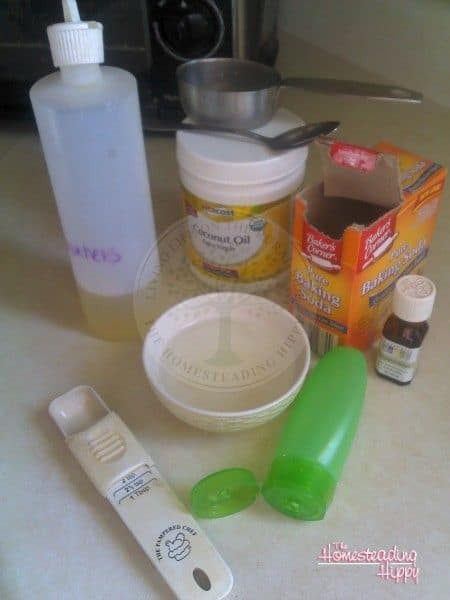 I’ve been interested in making my own deodorant but haven’t made the leap yet. I love it! We make a lot of our own products too, but haven’t tackled deodorant yet and will have to try it. Thanks for sharing! I love your site!! I have often thought about making these products myself. Thanks for sharing, i just need to do it instead of thinking about it. You mentioned that the shea butter will keep it nice and hard, even in the summer time? I didn’t see shea butter in the recipe? oooops!!! sorry about that…sometimes my brain goes faster than my fingers 😉 I added it in! What a great list! I tried making homemade tooth powder last year but didn’t like it so we switched back to store bought natural stuff. I’m pinning this so I can try your recipe! Do you have any trouble with the red clay staining clothing? no, it’s no problem at all. That shampoo spray sounds great, I might have to try that. Does that deodorant have any antiperspirant properties? no, no anti perspirant…the sweat glands are how our bodies get rid of toxins, and the antiperspirant keeps that from happening. So, you’ll sweat, but you won’t stink…does that make sense? I have the ingredients to make most of these! I’ve especially been wanting to make my own lotion. I also need to find a good recipe for homemade lip gloss or chapstick. Do you have another recipe for lotion without tallow. I try and not use animal products if I can. 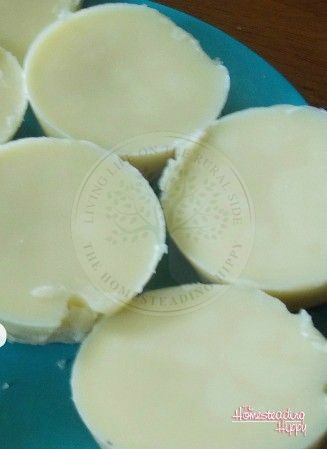 Making a homemade solid lotion bar is something I have been wanting to try! The only thing we have made is shampoo and conditioner, but the shampoo is a baking soda scrub. I would like to try these. But what is Dr. Bronners? Dr Bronners is the brand name of a liquid castille soap, found in most health food stores. You can also buy it online at Amazon. I really MUST start making my own deodorant. I am going to try the hairspray. Does it make your hair sticky? Wow, these look very interesting. Coconut oil is such an all around great product. You can use it in anything! Thanks for the tips. Pinned it. I’ve been wanting to try the hairspray for a while! The only thing that keeps me from doing it is envisioning a swarm of bees around my head during the summer. Have you had any issues with that? Or mosquitos? 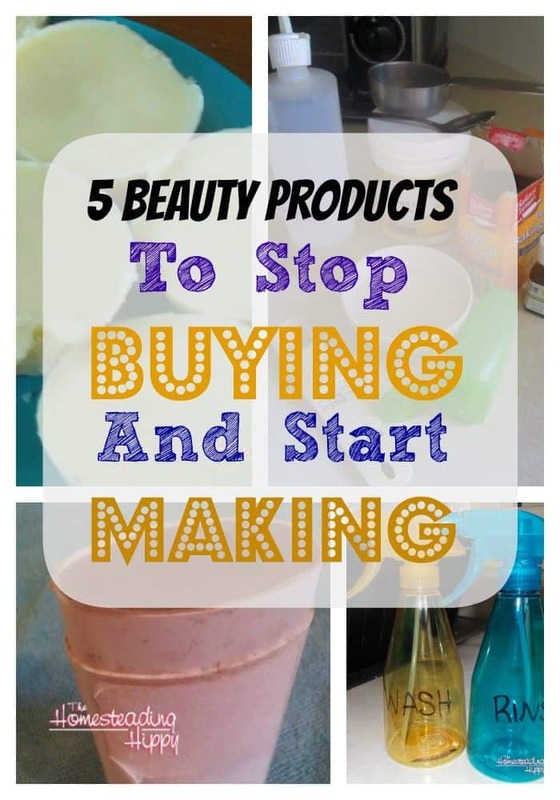 I want to start making more of my own household products this year, so I am pinning your blog post. Thanks for some great ideas! This is a great way to live greener and be frugal. i made my own lotion bars this year and the whole family is addicted to them – primarily my husband! i make a lot of stuff, but i like your recipes and will try them. thanks! Ok, I guest dry scalp in winter too, so I clearly need to try this shampoo recipe! Great idea – and wow, how much money you must save! Pinned this! I have been wanting to make my own toothpaste for a while, I guess I should get on that! We use vinegar as a hair rinse, but I don’t think the spray bottle would apply enough to be practical. I re-purposed an old shampoo bottle that enables me to pour a little ACV+H2O on my head for rinsing. 1. What do you store the lotion bars in? 2. How long does it take for your hair to stop being greasy from the shampoo? I tried to give it a week but had to switch back because I was going to a Christmas party. My roots are always greasy on the day I wash it and my entire head is fairly greasy the next day. I also didn’t feel like I had as much volume. I really want this to work for me! Depending on your hair, it can take 2-6 weeks. My fine hair took a lot longer, since I used to wash it everyday with commercial shampoo.